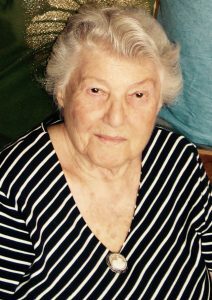 Matilda (Becker) Post passed away on January 23, 2019, at age 104. She was born in the Lower East Side of NYC to Sarah and Max Becker on July 4, 1914. She and her siblings grew up in mid-town Manhattan. Matilda was a graduate of Hunter College. In 1940 she married Ted (Theodore) Post. Matilda’s beloved Ted passed away in 1988. A few years later, she moved to Haslett, MI, to be close to daughter Ellen, Dany and family. Matilda was a strong advocate for Israel. She enjoyed cooking and baked delicious, personalized cakes for family and friends. She had a talent for telling jokes and began writing poetry in her 90s. Matilda baked the cake for her own 100th birthday party. Music was an important part of her life. She instilled a love for music in her children and grandchildren, played piano for many years, and entertained people with her harmonica until her final days. Our thanks to the compassionate caregivers and the outstanding and supportive team from Hospice of Lansing who cared for Matilda over the past year. She passed away in her home surrounded by loved ones. Matilda’s memory will be cherished by her children, Michael Post, Linda (Rob) Kreger, Ellen (Dany) Rothfeld, Mark Post (Leyka Barbosa), her grandchildren Yael, Liat, Talya, Kelly, and Elliot, extended family and dear friends and neighbors. A funeral service will be held at 10:30 a.m. on Friday, January 25, 2019, at Congregation Shaarey Zedek, East Lansing. Burial will follow at Evergreen Cemetery in Lansing. In lieu of flowers, memorial contributions may be made to Hospice of Lansing, Congregation Kehillat Israel of Lansing, Congregation Shaarey Zedek, or the Jewish National Fund. Arrangements are by the Estes-Leadley Greater Lansing Chapel. Praying for you and your family, Ellen, as you honor and grieve your mother today. We extend our sympathy to you.